Instability and variability is the essential characteristic of Gemini, because their element is air and they are under the influence of the planet Mercury (Mercury is also a flying god). 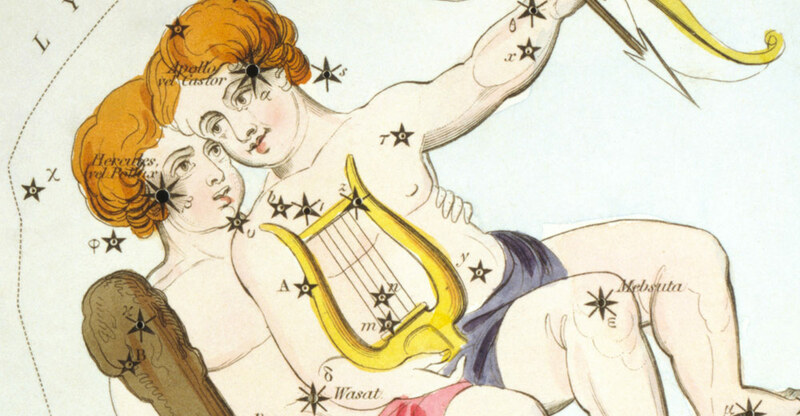 In the most typical cases you can perceive a certain nervous energy that surrounds Gemini. The brightest example is Johnny Depp in the role of Jack Sparrow in Pirates of the Caribbean. Inattention, eloquence and restlessness are brilliantly performed by Johnny Depp, as they are not strange to him. The secret is that he is a genuine Gemini. Gemini can change everything with ease – from hair style, dresses, ideas, to work or partners. Adjusting to significant life changes is much easier for them than for the other signs. Thanks to their communication talent, Gemini easily prove successful in advertising, media, public relations or even in politics. The worse they tolerate stereotype, the more they can be friendly, funny and eager for novelties. Gemini are entertaining friends, having no problem doing at least two things at once. Gemini do not gather assets. They would feel bound up. Gemini like to replace old things with new ones, although they may regret such experiments later on. Gemini are active and cheerful, but unpredictable. And therefore a bit mysterious, too. Instead of telling you frankly “I love you”, Gemini will keep their feelings secret. Typical Gemini do not stick to old friends, places and memories. They do not judge others strictly. People born under the sign of Gemini do not want to live a dull and monotoneous life. They will not go by train when they can fly by plane. Gemini have a brilliant sense of humor and diplomacy. They are responsive and receptive. The key element of people born under the sign of Gemini is the air and their planet is Mercury. The air suggests that they do not stand often with both feet on the ground. And if you imagine the god Mercury with his winged shoes, it will be immediately clear that instability and variability is the essential characteristic of Gemini. In the most typical cases you can even perceive a certain nervous energy that surrounds these people. The clearest example is Johnny Depp in his role as Captain Jack Sparrow in the movie Pirates of the Caribbean. This role is of course a bit exaggerated, but the important thing is that unpredictability, emotionality, eloquence and restlessness is not only brilliantly played by Johnny Depp, but that it is natural in some way to him. The reason and secret why he so perfectly portray such features is, that he is a genuine Gemini. The twins, which are in the emblem of Gemini, aptly symbolizes this zodiac sign. It is a reminiscence of a certain ambiguity, which may sometimes cause the feeling close to schizophrenia. Actually, the variable Gemini character can very well mix the reality and dream, the fact and illusion – all that they consider to be real. It belongs to their characteristic nature that they blend together what they dream of and what they want. They can talk eagerly about a certain idea or plan and the next day pretend as if nothing like that happened. Gemini can seamlessly change everything from the hair style, dress and belief to the work or love. To get used to a significant change in life is therefore much easier for them than for all other zodiac signs. Thanks to the communication talent Gemini can usually find employment in advertising or media (as an advertising expert, journalist …), in public relation (as spokesman), or even in politics. Gemini speak quickly and skilfully, so they can be very persuasive. They often have difficulty to settle down in one place or in one philosophy. To load the routine work on their shoulders is of course possible, but it makes them feel that someone is trying to clip their wings of freedom a bit. The worse Gemini tolerate the stereotype, the more they can be friendly and eager for entertainment and news. The brilliant ability of conversation is usually one of the characteristics features. The typical Gemini is a latecomer because something interesting always diverts his or her attention, when they are on the way. They know that they are a bit unreliable, so they naturally like to leave the back door open (to have an excuse or alibi at hand). Gemini are entertaining friends, having no problem doing at least two things at once. Certainly they can simultaneously handle a call, making lunch and even check the lottery numbers at the same time. However, do not await much patience from such “action hero”. Maybe when the Gemini gets older, only than can such birdie find out, that the life needs some solid foundations (lets say “a proper nest”). Geminis usually do not gather belongings. It would tie their legs and hands, when they want to be free. Money, fame, love, power – nothing is not enough for them. The grass is always greener on the other side of the road. Gladly they replace old things with new and unproven ones, although they may regret such experiments later on. The interesting inspiration for Gemini can be the Magician tarot card, because it shares many common features with their essential characteristic. Gemini often can not see the wood for the trees – they find so many things engaging, interesting and remarkable that they know something about everything, but nothing enough together. Their interests are so extensively branched that the profound approach to the subject is often not possible. You can describe his / her personality as distracted and talkative. If there is something that drives Gemini, then it is his or her wish to be informed about everything. He or she had many tips and hints in the pocket, can join in the conversation anywhere and is articulate, knowledgeable and witty. People around are amazed how Gemini can clearly argue and how brightly they are able to analyse. Intelligence and eloquence definitely belong to their personality description. Gemini are born interpreters. Working with the language is deeply satisfying for them. Less happy they are when it comes to feelings, because they often muddy the clarity of their ideas. Gemini are simply afraid of emotion and sentiment. The intellect of Gemini is permanently dealing with something. Their attention quickly pulse (what is a very important truth when we are focusing on personality). Although it can be attracted by only shallow problems, but at least such Gemini is fully focused for a moment. Thus, the otherwise balanced, friendly and cheerful Gemini can be described as an inherently ambivalent being – and that is the core of the Gemini’s personality description. His of her desire for an activity has much to do with the fact that there exists many natural emotional needs, which they fear. Therefore, their exactly working intellect does not usually notice that it is fundamentally dependent on moods, what is by the way also not easily understandable for the neighbours, family and friends. This intense intellectual orientation (thoughtful and dreaming personality) means that Gemini is from time to time a bit separated from his / her friends and tends to ignore them. Gemini’s mind is focused on all understandable, logical, but also on the unrestrained world of fantasy. Gemini have a great fear of the irrational world of feelings, loss of control and the fact that they might look untidy or careless. Gemini do not like strong principles and firmly planned paths. He or she would like to try everything – if possible without having to attach for long. Flexibility and sometimes clever tactics are among personal strengths of Gemini with which they can quietly bypass many problems. Rarely you will see a Gemini inviting others for a fight intentionally. They are sometimes impulsive and provocative. But aggressiveness simply does not suit well to their personality description. Also in his / her love life you can see a tendency to remain free. A flirt quite match the taste of Gemini. When the final choice is near you will hardly find another zodiac sign so indecisive and reserved as Gemini. After all, his or her reason says, that there is always something “pro” and something “contra”. The most beautiful love letters you will receive from Gemini. But who wants to be happy in a couple, must also constantly talk all matters, feelings and impressions with him or her. The characteristic way how Gemini men perceive the world is the tendency to gain the knowledge a priori, that means independently of practical experience. A practical experience is to embark on something, to enter on. However, Gemini men love their thoughts like painted on an easel or drawing board. Instead of the thorough planing they are only freely crossing over and being careful not to be captured. Gemini men are hardly able to admit their mistakes. They are usually cheerful and unpredictable. Such a Gemini man will leave on Monday to buy rolls for breakfast and will not return until Friday night, equipped with a series of incredible stories that all happened during that time. A typical Gemini man will not seek the tranquillity and harmony behind the walls of a monastery. He is pride on the wide range of interests and hobbies and you will be amazed how active such a man really is. And his personality traits? Spirited, impenetrable and therefore mysterious – this is a Gemini man! If you want to accompany him longer, you have to be able to inspire and to boldly change along with him. Men born under this zodiac sign sometimes hide their true intentions. Rather than telling you frankly that they love you they will keep own feelings as a secret. As you surely know, Gemini is the symbol of twins, and therefore such a man often do not even know which feelings to believe. The duality is deeply rooted in their personality and projects automatically into all views and convictions. Gemini man feels that he can not be indifferent to all women just because he wears a wedding ring on the hand. He could drink one brand of whiskey, but why would he impoverish his life when there is a beauty in diversity. Gemini men are rarely sentimental. They usually do not stick to old friends, places and memories. They do not judge others sharply. Gemini man is a good example of the principle that the truth may not be absolute, but rather a matter of agreement, depending on the circumstances. Her basic personality traits are the same as man's. To examine things thoroughly often means to to remain in place, to settle and reduce the desire for open air and exuberance. A Gemini woman would like to make decisions by her intellect, but it is often beaten by the voice of the heart. A woman born under the sign of Gemini is objective, open and impartial. It is a great companion, mate and colleague at work. She smiles, even though there is no obvious reason. In her youth, it is usually a fickle and capricious girl who likes having the fun. At a later age, it is a clever and creative woman who usually do not find the stereotyped role of a housewife very attractive. Men should beware of emotional gymnastics which such an energetic woman is able to perform. If you encounter a typical example, then she is the one who wants to be happily in love, but keep failing for some reason again and again. The Gemini woman forgets quite quickly, therefore it is better to stay in close contact with her. And if you find that she is not able to be attached to one person in the long term, show your compassion instead of anger. It is her natural personality trait and not just a whim. The Gemini women do not want to live a monotonous life. They will not take a train, when they can fly a plane. They do not watch TV at home, when they can go to the cinema or theatre. They like the change, which has its undeniable positives. Such a woman will not blame you for looking for a new job or wanting to move elsewhere. Moodiness and restlessness is apparent among her personality traits. The Gemini woman can beautify your home beyond recognition. Extravagant combinations are natural to her. She can estimate better than anybody else where are the boundaries between engaging eccentricity and ordinary kitsch. The Gemini woman may not be a partner for an easy life, but surely you will experience countless moments of excitement with her.